While creating an elearning module, I have come across a very curious error. The PPT has around thirty slides, and most of them are with audios. While reworking on some of the slides as per the SME's instruction, I needed to update the audios of some of the files as well. But on clicking on the import audio button, what popped up was the following interface. Can anyone tell me what does it mean or how can I retrieve back my imported videos? Or does it mean that I have lost all my audio files? Help Please! Have you tried restarting the computer and duplicating the issue yet? Give that a shot if you haven't already done so, and let me know the result. Thanks! I see buggy stuff like that all the time. It usually pops up after - or in between - importing audio, adding attachments, or changing slide properties. My fix is to save the PPT file and relaunch PowerPoint. I now do this just to avoid these kind of problems. It's much easier to do that than to import 30 audio tracks, only to find none of them 'stick' after saving. Sometimes I do need a system restart, as Peter suggests. I find the software reboot usually does the trick though. Thank you very much. Yes I had tried that, and it worked. I never thought it was so an easy task. What I needed to do was just restarting the system. Duplicating the issue was not required. Thank you so much. Now it is working fine. If we are working on a networked system, I found it very difficult to proceed after saving it in a shared folder. Often they ask me to save the file into a different name, since the exisiting file is corrupted. If we are working on a PPT with animations and objects, the chance for such disturbances are relatively very high. So far there are so many versions of the same working file, and now what I did to avoid such troubles is to save it in a local drive and work. But, this time unfortunately this curious case of missing audio files happened. Out of desparation, when I tried to restart the system, it began to work fine. Thank you so much for your help. Awesome, Tom! Glad you got it resolved. I'm experiencing similar problem as above where I import the files (which are now in the correct .wav format) and it works well the first time I go and preview. However, after a couple of hrs or downtime or re-work on one of the slides the audios which I had initially imported (VO for over 50 slides) are no longer there - simply disappeared. This has happened several times and I cannot believe that I have reboot presenter over and over again or restart my system all the time. 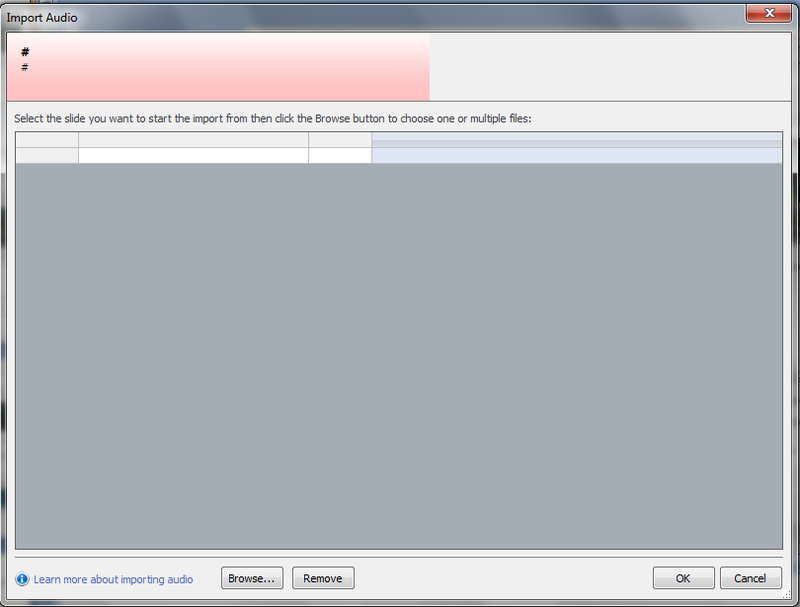 Come on articulate!, this bug or issue has got to be resolved or fixed...its rather annoying. Just when I think I've got the hang of this software or i'm about to finish and publish my work to the client some issue always crops up. Hi Ejidayo, really sorry to hear about the issues you've been experiencing. Would you mind telling us a little more about your environment - are you working from your local drive? Saving your project to a local drive? Any unusual characters in your published file path? Unusually long file path, perhaps? If you'd like to contact our support team, they'd be happy to work with you to try and ge this issues resolved. I am working from my local C:/ drive and saving to both this local drive and dropbox as additional backup. The file path name for dropbox is long - it goes thru 5 folders names (could this be the issue?). Right now, I have been following the advice of one of the users i.e. saving and closing out of PPT as often as possible and then re-opening PPT and importing a few more audios. This seems to have worked - for now. Glad to hear your approach is working, but if you happen to run into any further issues, please don't hesitate to reach out to our support team. I have not seen the audio file loss problem I mentioned above in some time - not since I started running AP '09 (V6.3.1103.112 Pro) on Vista, in emulation (using VMWare), on a 27" iMac (i7). This setup has been working flawlessly, even when project files and assets are on my drive's Mac OS partition.